The other day we saw LockMemos, a change that appeared in Cydia that allowed us to put reminders on the lock screen , but reminders of the native app "Reminders" from Apple, but we had to put reminders in iPhone settings, perhaps some developer saw it and wanted to improve it, there is born Reminders +. Reminders + reminders place us (this time, the native application "Reminders") on the lock screen, like notifications. Very easy to forget that not so important that we have to aim. To put a reminder on the lock screen you should go to the Reminders application, letting down the reminder you want and a menu like cut / paste that allows us to add to the lock screen as a notification, so you will have to disable it the same, perhaps this is the weak point of the tweak, which is not convenient to take on and off, ideally, leave the default reminders and slide them as if to open the notification were hiding, we hope to implement it in future versions . Of course it is much more comfortable than LockMemos, so if you liked LockMemos you know, to try and Reminders + desisntalar. 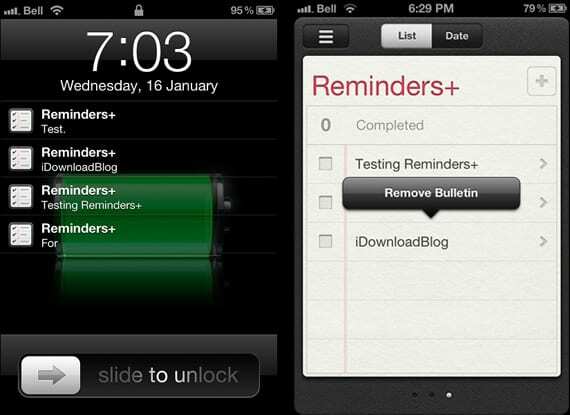 Article Reminders +: reminders placed on the lock screen (Cydia) was originally published in News iPhone .